The Uffizi is one of the most famous museums in all of Italy, if not the world, known for its late Byzantine and Renaissance masterpieces. It is also one of the largest museums in Italy, stuffed with treasures and wholly overwhelming if not visited with a guide. 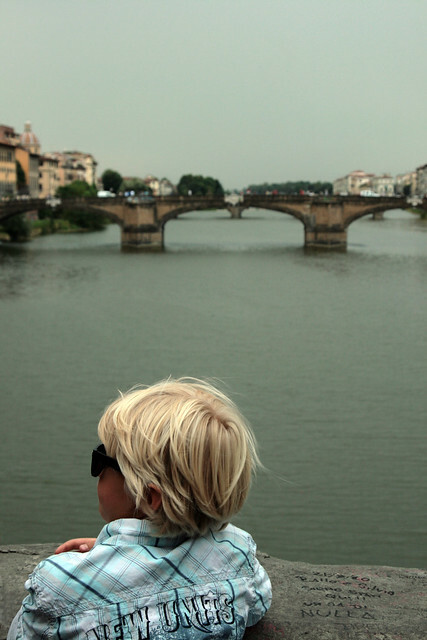 We recently toured with Emanuela, one of our most popular tour guides for Florence, who is also an art historian and mother of two elementary school-aged kids. We met at the museum entrance and skipped the line with our pre-booked tickets (by far the best way to enter the Uffizi), and Emanuela began our visit with a bit of history about the museum building itself before focusing on the collection. Her visit was perfectly paced: we paused in front of the most important artistic milestones for an explanation, then would walk purposefully through a series of lesser rooms, steering clear of crowds and distractions. About halfway through our tour, Emanuela suggested a well-earned pause at the rooftop snack bar to regroup, and then we toured the lower floors. If your kids have studied a bit of art history - or if you've prepared them for your trip with some children's books on the Renaissance masters - they will expecially enjoy seeing the Uffizi's larger-than-life iconic works, including Botticelli's “Birth of Venus”. My boys were most taken with the Caravaggios, with their blood-curdling sacrifice and Medusa head. Even younger kids are impressed with Michelangelo's towering statue of David, one of the most recognized sculptures in the world. Our day began in the Uffizi and ended in the Accademia, so the discussion of this masterpiece was a continuation of the art history conversation begun a few hours before. Again, we sailed in past the line with pre-booked tickets, and began our exploration with Emanuela. The Accademia is a much more accessible museum, given its smaller size and collection. It's a perfect palate cleanser after the Uffizi, where the rooms seem endless, even under the direction of an expert guide. Here we spent almost the entire visit in the hall housing the David and the famous collection of Michelangelo's unfinished works. The sheer size and charisma of these statues kept us all enthralled for the duration of the visit, and I found that I was ready to leave before my kids were! Again, if your kids haven't studied any art history, you may find that they get much more out of a visit to the Accademia, even a guided visit, having done some fun, kid-friendly research on Michelangelo and the David before visiting. Also, there will almost certainly be some discussion of full frontals and buttocks if you have boys. Be prepared. If you are planning an entire day tour, you will probably begin at the Uffizi in the morning when the gallery halls are less crowded, and end at the Academia after lunch. 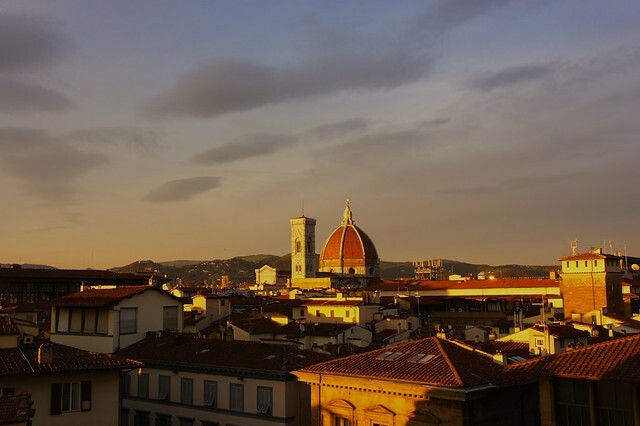 Between these two stops, you will walk right through the Piazza del Duomo, home to Florence's magnificent Santa Maria del Fiore cathedral. Kids can easily get church fatigue, but the Duomo is such ornate eye-candy that it catches the attention of even the most disinterested 8 year old. The towering Gothic structure is covered in white, green, and pink marble, mosaics, statues, and delicate stone-work. Brunelleschi's famous dome towers above the city, and the more courageous can climb the 463 steps to the top of the dome, first passing along a walkway circling the inside of the cupola to see the inside of the church from above, and then a final flight of stairs to the lantern for a bird's eye view over Florence. Young travelers are especially taken by the stunning bronze doors of the duomo's baptistry, especially the eastern Gates of Paradise by Ghiberti (a copy of which is on the baptistry; the originals are now in the Opera del Duomo Museum) and the vertiginous 414 step climb to the top of Giotto's belltower, both in the piazza facing the cathedral. You have probably tried the patience of even the most interested grade schooler with art and culture, so to blow off some steam and get a change of pace, spend some time at the Boboli Gardens. Access is through the Pitti Palace (home to a number of galleries, if you want to push your luck), and the grounds dating from the 16th century are a good example of Italianate style. The vast lawns are dotted with statuary and fountains, and have fun grottos, pavilions, and temples to explore. More an elegant outdoor museum than a playground, there are some rules regarding visits (you must stick to the pathways in most of the grounds, and if you bring in food and drink, you must consume it “with discretion”), but this is a perfect mix of Medici splendor and family-friendly freedom. This history of science museum right around the corner from the Uffizi is fascinating for older kids and teenagers who are interested in science and the great thinkers of the past. The rooms are divided by theme, including anything from astronomy to warfare (a favorite), and antique scientific instruments from the Renaissance and later are displayed in well-marked cases with excellent explanations in English. There is also an interactive section of the museum, where visitors can try their hand working some replicas of these precursors to our modern technology. If your kids liked the Museo Galileo, you can also stop by the smaller Museo Leonardo da Vinci, with scale models of some of his most fascinating machines. 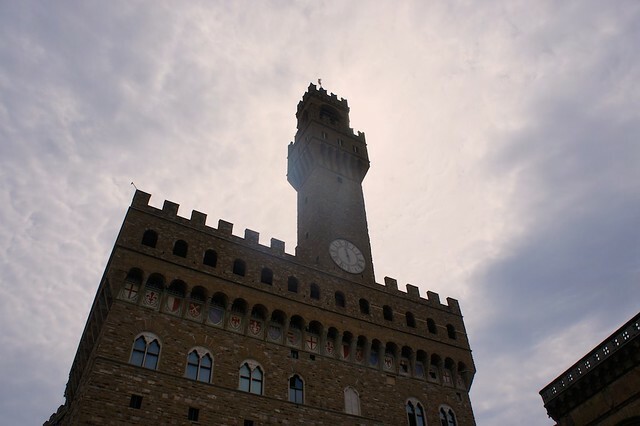 Located in Palazzo Vecchio next to the Uffizi, the Museo dei Ragazzi is Florence's answer to the new trend of interactive, kid-centered museums. Here, visitors can either join an organized interactive tour (you have to book ahead for English) or rent a "Kit for Families" for a self-guided visit. The museum is aimed at introducing children to life during the Renaissance, including furnished rooms, period clothing and shoes, and interesting explanations about what life was like for children during the time of the Medicis.